The cannabis industry is experiencing massive growth across the nation in the wake of another wave of state-level decriminalization. And in New York City, the titans of finance are crunching the numbers and starting to feel very bullish on bud. “On election night, eight out of nine cannabis-related ballot measures passed across the country,” Chris Walsh, editorial director of Marijuana Business Daily, told a buttoned-up crowd. “It was almost a clean sweep for marijuana and that was a shock to even the most optimistic people in the industry,” Walsh said, from the sleek, glass-paneled room overlooking Park Avenue. On November 8, U.S. voters doubled the number of states where recreational marijuana use was legal. Eight states and the District of Columbia are now on that list, with California, Massachusetts, Nevada, and Maine voting to legalize it. 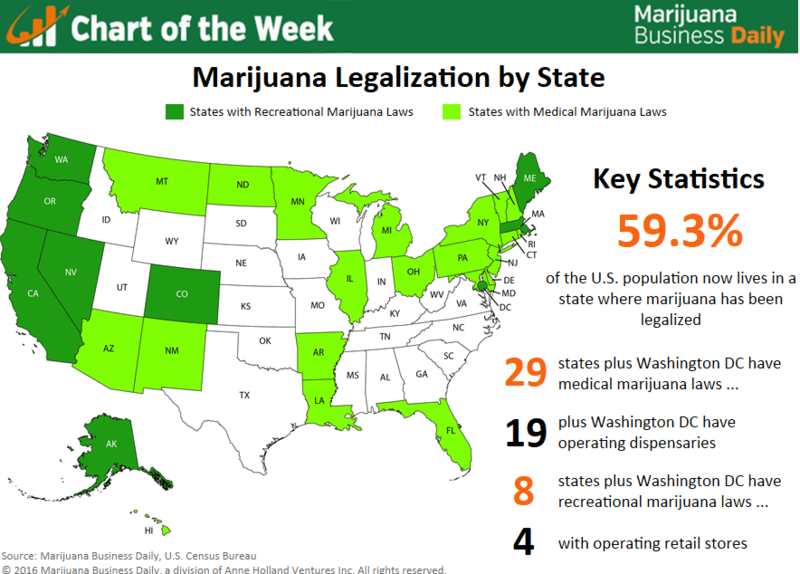 In addition, voters expanded the availability of medical marijuana to a total of 29 states and the District of Columbia—with Florida, North Dakota, and Arkansas approving it and Montana increasing access to it. The election results represent a resounding victory for cannabis proponents and will codify shifting national attitudes, one month after a Gallup poll showed 60 percent of Americans are in favor of legalizing marijuana. In the last week, however, cheers among marijuana advocates have turned to worried whispers after president-elect Donald Trump nominated a virulently anti-pot politician for U.S. attorney general, Alabama Senator Jeff Sessions. During the panel, Walsh acknowledged those concerns, admitting that a Trump presidency and the appointment of Sessions as the nation’s chief law enforcement officer, had left “a big question mark” for the industry. The worst case scenario, he said, would be a swift crackdown on companies involved in the cannabis business. But a Trump presidency and a Sessions justice department did not damp the optimism among the panelists. The experts in the room seemed to agree that the burgeoning multi-billion-dollar cannabis industry and its potential to create new jobs meant that the outlook is still good. “Extremely optimistic,” said Asher Troppe, co-founder and CEO of investment firm Tress Capital, noting the wins across the country. California in particular, Troppe said, was “a big deal” as it represents the largest local cannabis market in the world. “We believe it’s very hard to put the genie back in the bottle at this point,” he added. Nevertheless, panelists and audience members rattled off a series of hurdles that remain to investing in cannabis-related business—beyond the recent presidential appointees. Among those issues, panelists noted the major banks’ reluctance to open accounts for industry businesses and the resulting cash-only market with its inevitable security problems, the opposition of pharmaceutical companies to pro-legalization initiatives in some states, and other pitfalls for investors including predatory “snake-oil salesmen” and under-educated forays into the unique marijuana market. But the inherent risks in investing in an industry plagued by legal gray areas is also part of what may make it a potential moneymaker. “If you can navigate that appropriately, you’re going to have time to build a profitable business before Phillip Morris, or Yelp, or Amazon come into the business, because they will not come into this business until prohibition is lifted,” Kaminsky said, referring to federal laws that continue to list marijuana as a controlled substance. Several attendees agreed that the panel discussion itself may mark another historic milestone in the legitimization of cannabis as an investment-ready commodity. “Look where it is,” Walsh said after the panel discussion, turning towards a wall of flatscreen panels emblazoned with the Bloomberg logo. It’s a far cry from a marijuana convention, he said, noting an absence of tie-dyed t-shirts in the room. TELL US, are mainstream investment groups ready to invest in cannabis? Great article, it would be great to see institutional capital enter the industry to sway politicians towards legalization. The real button pushers reside behind dollars and once those dollars are invested the industry will become much more stable.